401 in stock Need More ? Reprint. Kingsbridge series Maps on inside covers. Originally published: 2017. 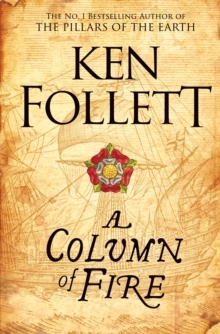 Millions of readers have been enthralled by the saga that began in The Pillars of the Earth and World Without End, which now continues with Ken Follett's magnificent, gripping A Column of Fire. A WORLD IN TURMOIL1558, and Europe is in revolt as religious hatred sweeps the continent. Elizabeth Tudor has ascended to the throne but she is not safe in this dangerous new world. There are many who would see her removed, not least Mary Queens of Scots, who lies in wait in Paris. A NEW ORDERElizabeth determines to set up a new secret service: a group of resourceful spies and courageous agents entrusted to keep her safe and in power. As she searches for those who will make the difference, one man stands out. A MAN WHO WOULD DIE FOR HIS QUEENFor Ned Willard the opportunity to serve his queen is God-sent. He cannot stay in Kingsbridge and watch the love of his life marry another, and as fires burn and extremism begins to spark throughout Europe, Ned makes his choice. He will spend his life protecting his monarch from the tyrants who aim to destroy her or die trying . . .